Budgerigars can be taught to speak and whistle tunes. In fact, they are believed to be the best talkers of all birds. They can learn to pronounce hundreds of words and phrases. In fact, one California budgie is said to have had a vocabulary of 1,728 words by the time he died in January 1994. Another budgie called "Sparky Williams" had a repertoire of 8 nursery rhymes, 360 phrases, and a vocabulary of over 550 words. In fact, this little budgie became a star and 20,000 copies of his records were sold by the time he died in 1962. They are intelligent and social animals and enjoy the stimulation of toys and interaction with humans as well as with other budgerigars. A common behavior is the chewing of material such as wood, especially for female budgerigars. In captivity, budgerigars live an average of five to eight years, but are reported to occasionally live to 15 if well cared for. The life span depends on the budgerigar's breed (show budgerigars typically do not live as long as the common budgerigars) and the individual bird's health, which is influenced by exercise and diet. These little jewels are thoroughly under-priced and therefore under-appreciated. They are often kept in tiny, boring cages that don't allow them to get sufficient excercise and play, as they like to do. 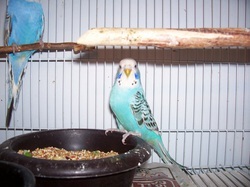 A cage should be able to accommodate several perches and toys, food and water dishes -- in addition to leaving space for the budgie to fly from perch to perch. Budgies are often given to kids as pets and neglected once the "novelty" wears off. Thousands of them starve to death or die from dehydration caused by empty water dishes. I strongly believe that if YOU don't like birds, please don't give one to your child as a pet, since in the end there is an excellent chance that you will end up as the primary caretaker. However, if you enjoy animals and love interacting and watching them - you are likely to form a wonderful relationship with one or two of these special little characters.